I made this potato gratin using a cheese sauce, it is very simple and takes no time at all, I do use a mandolin to slice my potatoes (about an 1/8 of an inch) which is really easier. 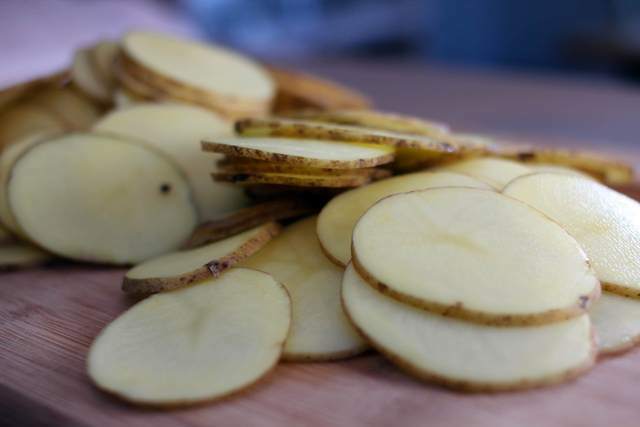 I also make my sauce first then slice my potatoes as I go, for me it works so I don’t waste potatoes. I’ve used a 3 qt. or a 9×13 baking dish. Depending on the size of the dish I will do any where from 4 layers to 6 layers. You can use other flavors or kinds of cheese, just make sure the cheese is shredded first, I like to use Cabot brand or something along those lines. I put my cheese bricks in the freezer for about 15 minutes before shredding, this helps with the crumbling of the cheese and shreds easier. Also I use beer or wine in this recipe, you can use either or stock if you choose not too. I hope you enjoy!! Spray baking dish really well with non-stick cooking spray or generously coat with softened butter. 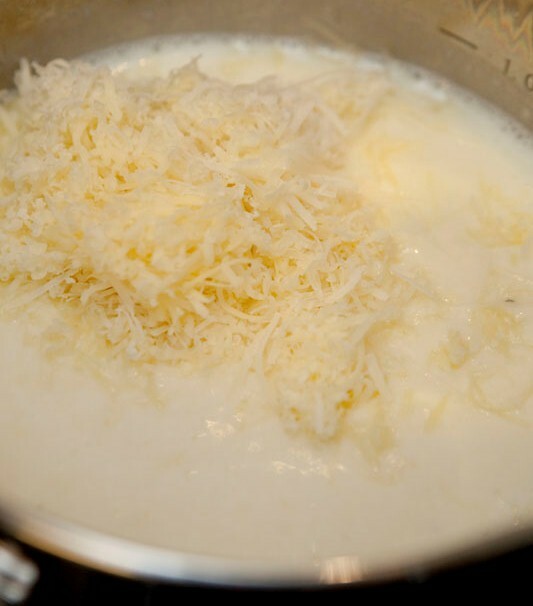 In a food processor using the shredding disc, shred both bricks of cheese, pour into a bowl; set aside. whisking to incorporate cheese into mixture. 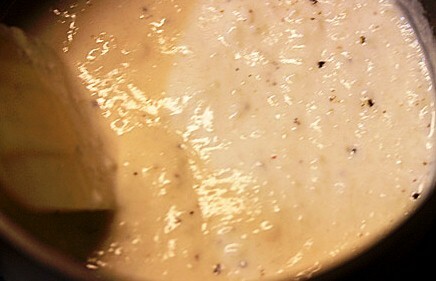 Once all cheese has been added, keep whisking until all cheese is melted and well incorporated, turn off heat. start layering potatoes slightly over lapping, after each layer, with a large serving spoon ladle a couple of spoonfuls of cheese sauce over the potatoes, another layer of potatoes, then sauce again, then push down on potatoes this will allow the sauce to spread out, keep with the layering of potatoes, sauce and pushing down. 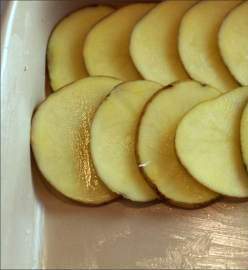 Slice more potatoes as needed, once your down to the end of the sauce make that the last layer of potatoes. Cover with foil and bake for 30 minutes. 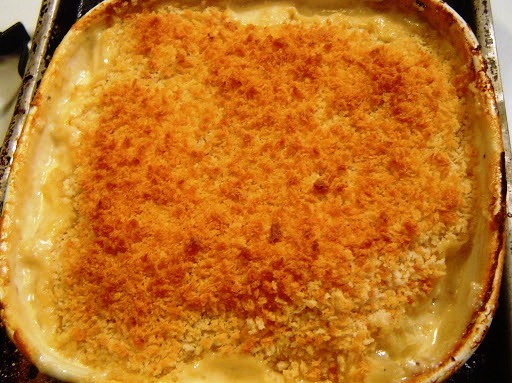 In a small bowl add panko breadcrumbs and 1/3 cup beer/wine/stock, mixed together till well combined, remove foil from potatoes and sprinkle bread crumbs all over and bake uncovered for 20 more minutes or until golden brown. Allow to stand for a few minutes before serving, I like to cut into squares first and they pop out easily.